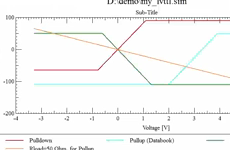 If you want to perform a signal integrity simulation you need IBIS or DML models. These models describe the electrical behaviour of the component input and output signals. These models are normally provided by the IC vendor or your component distributor. But in many cases it takes some time to get these models and a simplifies model would be sufficient for initial simulations. This FloWare App Ibis Prototyp Modeler creates easily simplified models based on the information of the datasheet. These models might contain information about saturation, clamping, bidirectional or differential transmission.